The financial savants of BitSharesX have overturned the laws of economics once again. Short memory. Recall that only last week the peg broke – in its first week of operation – and the devs had to unilaterally intervene to shut down the entire BitAsset market as a result. How has this problem been fixed, pray tell? Why… more BTSX derivative collateralisation, of course! …Preston, I mean, I know you have some pretty funky/esoteric interests… but what the hell are you talking about? BTSX can create “BitAssets” whose value are notionally pegged to their real-world equivalent, such as a bitUSD (pegged to the US dollar) or a BitMarmot (pegged to the spot rate for chubby, adorable ground squirrels of sound mind and character of the genus Marmota on the Chicago Marmot Exchange). The market value of the BTSX on the day the trade is entered into is collateralised with an amount of BTSX priced as equivalent to the nominal value of USD on the long side and 200% of the BTSX on the short. This might sound great, but in the event that the market loses confidence in BTSX, BitUSD starts trading way below par, which happened last week. In fairness to its creators, the software is a great idea from a dev perspective but makes (in my view) no economic sense. It’s a perfect platform for an undergraduate (or maybe taught M.Sc.) thesis for a sociology/comp sci double degree. It’s a horrible project as a real world asset trading platform or bank. …ok, right, I get it. What’s the upshot? There are a couple of things going on here. First, there’s no such thing as USD in BitSharesX – only BitUSD, the BTSX USD derivative of which I’ve been so highly critical over the past few weeks, and which (following the most recent changes to the protocol) can only be created in accordance with a “price feed” – i.e. price-fixing – from a group of ‘network delegates’ whose appointment is procured by the majority of the holders of BTSX voting in favour of them. This means that BitAssets will not be created unless the BitAsset (as a BTSX-denominated derivative) is priced within +/- 10% of the spot rate set by the feed on that day. Whither BitSharesX, then? Apart from the fact that control of the BitSharesX “DAC Bank” and “decentralised exchange” has been shown to be squarely in the hands of the devs and not really decentralised at all, under the new arrangement the the collateral sort of hangs out like a millstone around market participants’ necks; the participants themselves are expected to cover their losses with brand-new bitUSD (itself a derivative) which they purchase and pump directly into the transaction on an ongoing, as-needed basis. Presumably the “virtual collateral” will eventually get drawn if you fail to pay up – which gives the party shorting a BitAsset in a falling BTSX market absolutely zero incentive to contribute funds above and beyond the collateral that’s already been posted, for reasons that will be very familiar by now to readers of the BitMarmot Saga. To be fair, the new arrangement might buy a BitAsset a little more time in a falling market. It will not, however, buy much. For markets over which the BTSX team doesn’t exercise control, such as Bter, I expect the genuine BitUSD/USD market to remain pretty tepid. Indeed, the new arrangements simply increase participants’ exposure to BTSX even more quickly, meaning the effects of a falling market will be even more pronounced. 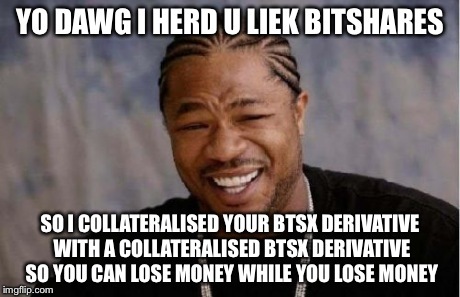 The upshot of what we’re now being told is that, instead of needing to spend $3 to buy and post BTSX to create and maintain $1bitUSD, that model doesn’t work, so the clear answer is to spend more money buying BTSX to make netting payments on the $1bitUSD derivative (which is 300% collateralised in BTSX) by buying more bitUSD derivatives (which are themselves 300% collateralised in BTSX) so that your 300% collateral doesn’t get dinged. And as BTSX also serves as a medium of exchange, it’s effectively cash collateral. This is commercially insane. Too funny. I’ll bet you a #BitMarmot that the Securities and Exchange Commission finds it pretty funny too. 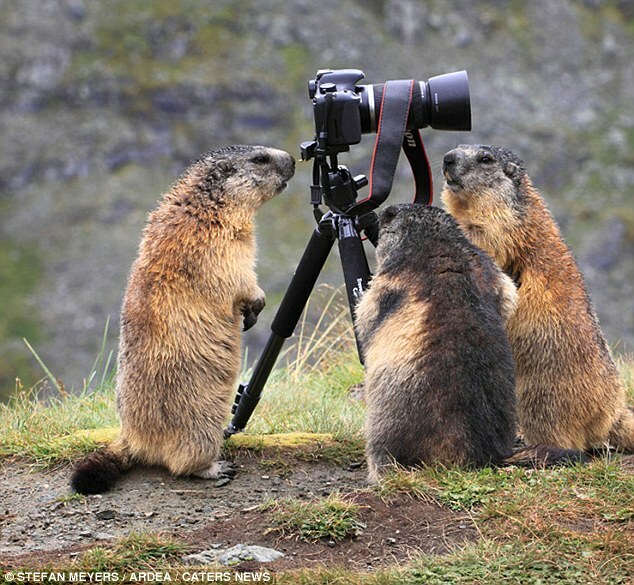 For the price of 1 BitMarmot worth of BTSX collateral, the market could go out and buy 3 marmots. Pretty clear-cut: 3 > 1. Marmot > BitMarmot. Fuzzy > not fuzzy.